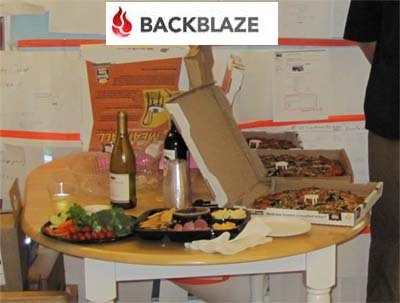 On Wednesday, 5/6/09 Backblaze held a reception for a very specific set of people that are all involved with Backblaze in the same way. The invite list was very exclusive: 1) Freeman Murray, 2) Ed Bugnion, 3) Ulrich Gall, 4) Tye Bash, 5) Angela Lai, 6) Keval Desai, 7) Randy Wilson, 8) StuartCheshire & Pavni Diwanji, 9) Howard Chartock, and 10) Vlad Bolshakov and 11) Harris Mirkin. 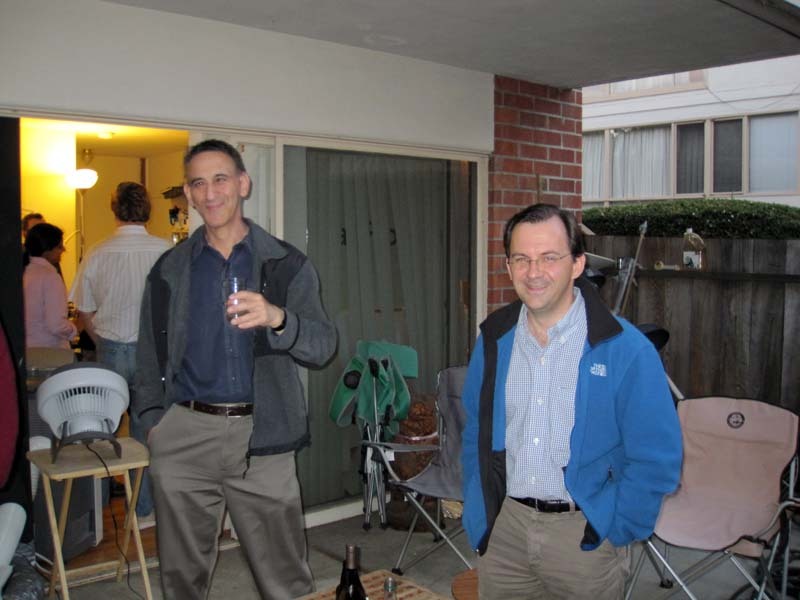 Only Freeman, Keval, and Harris could not make the party, the rest are found below intermixing with Backblaze partners. Click on any picture below for an enormous size original. 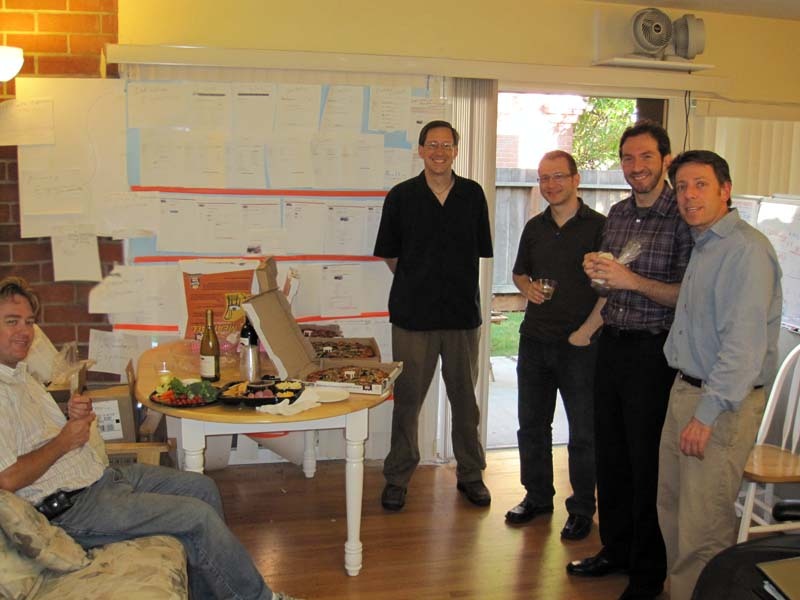 At the reception, below is Stuart Cheshire on the couch, then Randy Wilson by the table, Vlad Bolshakov, Gleb Budman (Backblaze CEO), and Tye Bash. 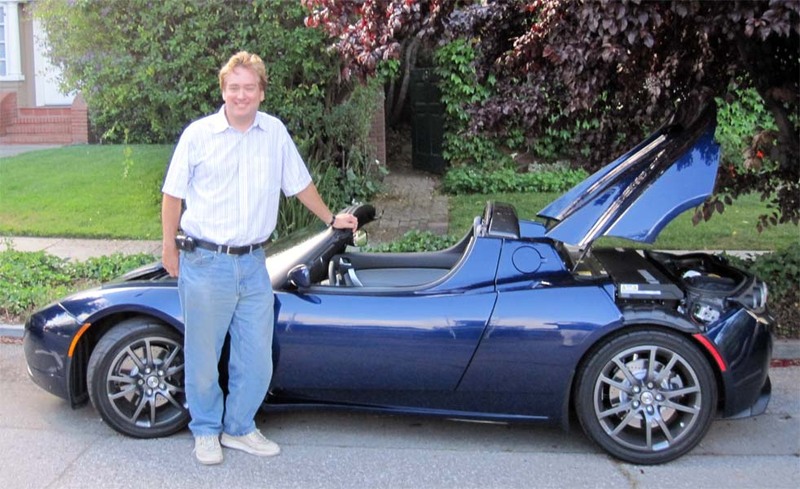 Stuart is at Apple and is famous for his work on Zeroconf and Bonjour (network discovery protocol). Randy is a researcher working at Google in their Google Earth team. Vlad is an amazing software engineer that has worked with our team closely over the years, and we have known Tye socially for years and years but this is the first time he has been involved with our team for business. 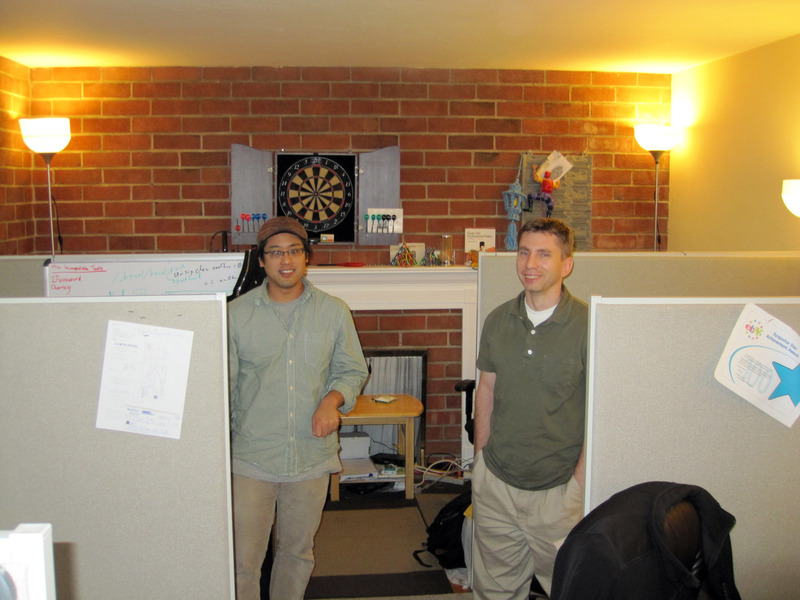 Damon Uyeda (Backblaze Architect and Macintosh project lead) and Casey Jones, Backblaze VP of design. 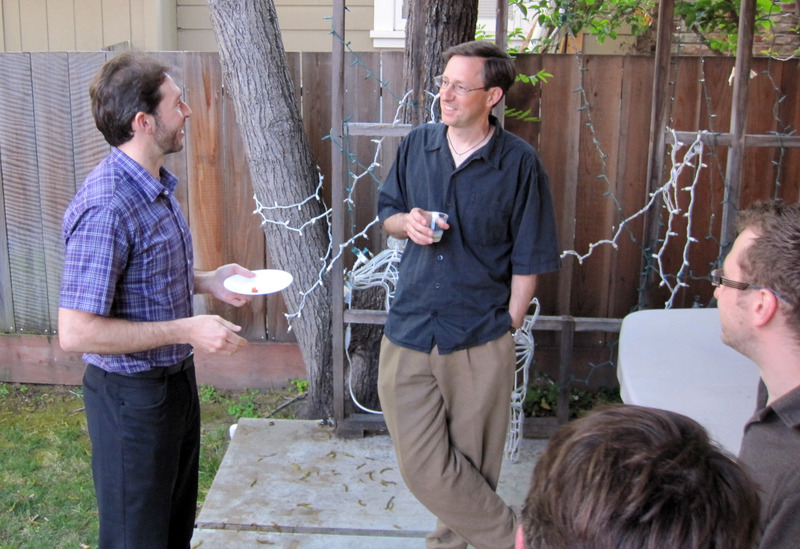 On the back patio, Gleb Budman talks with Randy Wilson about online Backup and our business. We were lucky enough to have Ulrich Gall in town from his world travels and he was able to attend the reception. 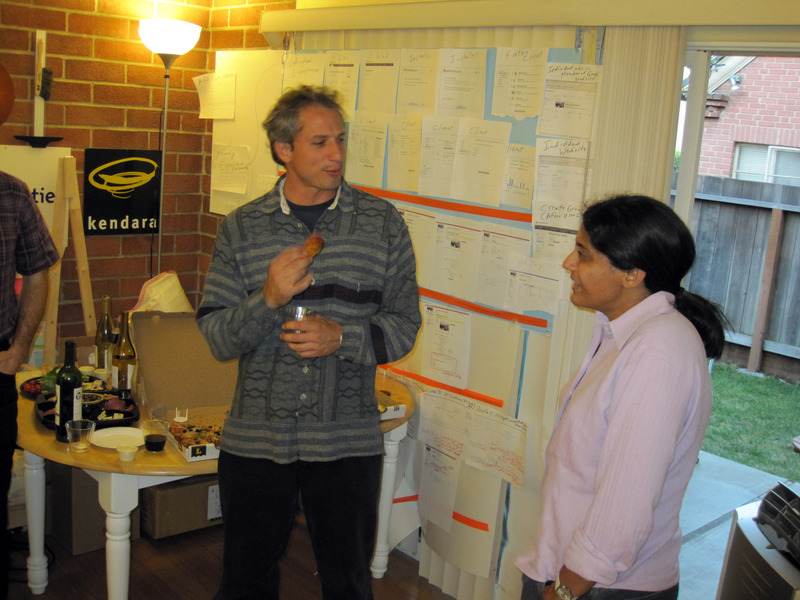 In the picture below Ulrich is talking with Pavni Diwanji who was the CEO of our team in a previous company (MailFrontier) and now works at Google. Ulrich and Pavni have known each other for years. Howard Chartock and Ed Bugnion. Ed was one of the 5 founders of VMware and the CTO of VMware. Most recently he is a VP at Cisco. 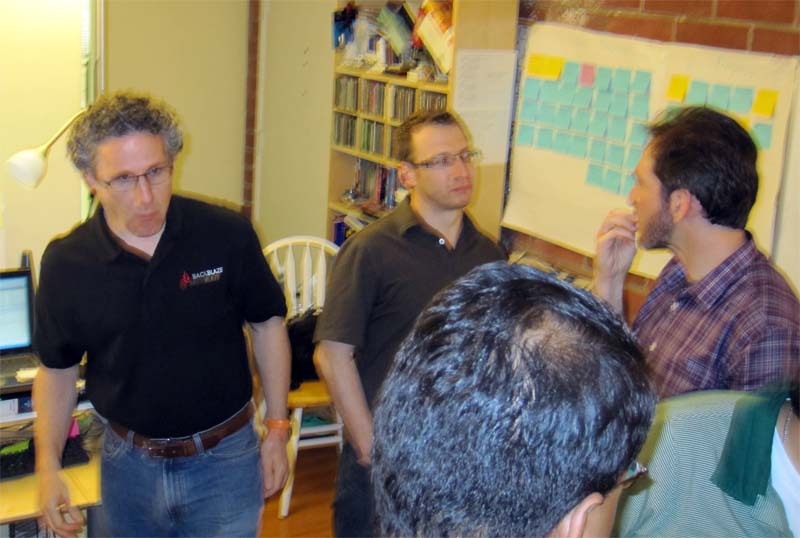 The blurry picture below (bad photographer) from left to right is Tim Nufire (VP of Engineering at Backblaze), Vlad Bolshakov, and Gleb Budman. 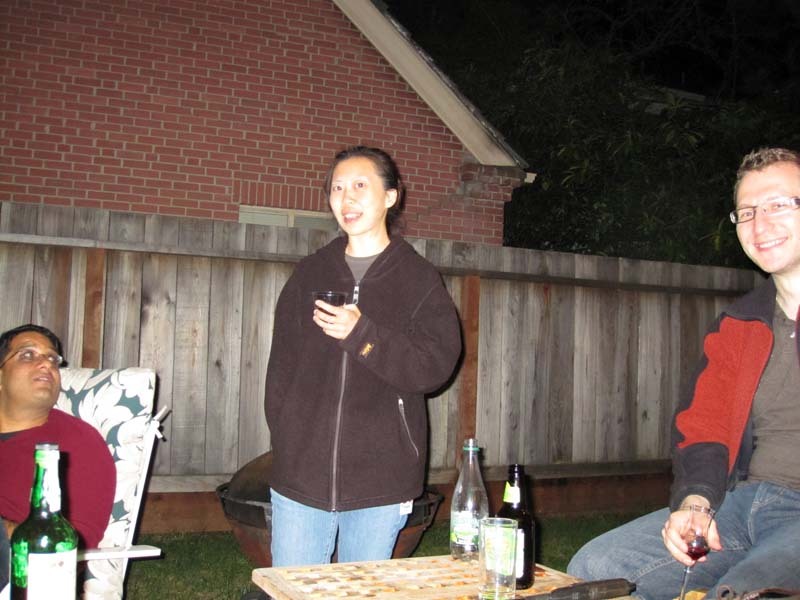 Later at night as the reception wound down, of few of these important contributors to Backblaze's success had a glass of port on the patio. From left to right below is Stuart Cheshire, Ed Bugnion, Nilay Patel (VP of Backblaze Sales), Vlad Bolshakov, and Randy Wilson. Making a late entrance JUST in time to say hello is Angela Lai. 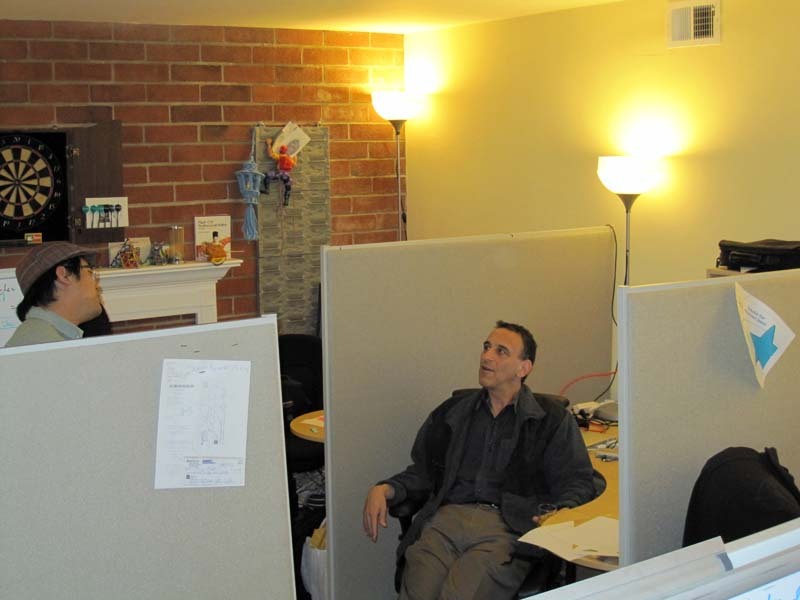 Angela is a technical powerhouse who has worked with us (and we have worked for her!) on several projects in the past. Right now Angela is a Director at Google running a lot of the AdWords project. We are extremely lucky to have Angela helping us at Backblaze. 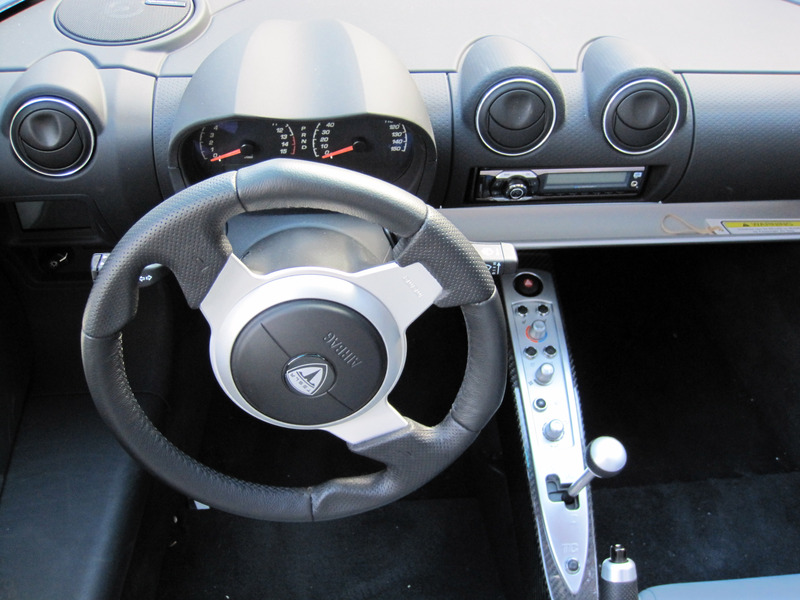 Below is a picture of the Tesla Roadster's cockpit. Below is a close up of the dash board controls of the Tesla Roadster. 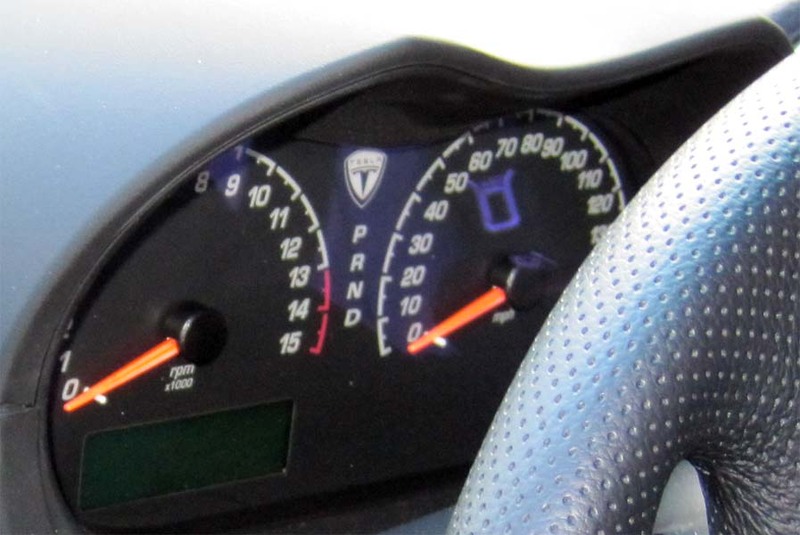 It is interesting to note that the Tesla has a tachometer, even though it only has one gear! This means the tachometer is tied directly to the speedometer and displays exactly the same information, and because you cannot shift (only one gear!) there is no possible decision you could take based on the tachometer's information. 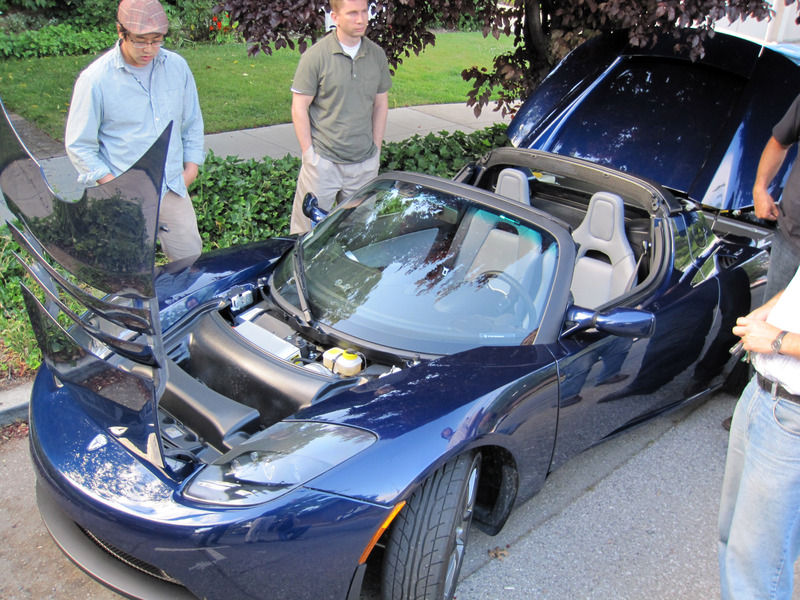 Here is the Tesla Roadster opened up for our geeky inspection. :-) That's Damon Uyeda and Casey Jones behind it.